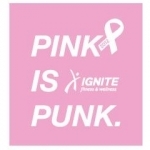 For the 4th year running Ignite fitness & wellness will raise funds for Breast Cancer by hosting a family Swim:Run event at Atlantis Aquaventure on The Palm. Starting with 400m swim and a 1.6km run all participants will get a free T-shirt, goodie bags, full day access to aquaventure and the afternoon treasure hunt at Atlantis. We have received huge support from sponsors and goodie bags will be stuffed full of give aways including brands such as Speedo, Go-Sport, Lorna Jane, Coega Sunwear and many more !! Atlantis have put up some great prizes and in addition to a full day pass to aqua-venture and the afternoon Atlantis treasure hunt have also offered all participants the opportunity to attend breakfast at Saffron for just AED 100. Kellogg’s will be there with a sampling station with post race snack bars to re-fuel. Dubai London Clinic will be on site to talk about screening for breast cancer and at the Ignite stand we are offering DNA analysis tests which reveal risks and actions that can be taken should you be found to belong to a high risk group. Its going to be an action packed day, something for all the family and for an amazing cause. A swim:run event in aid of Breast Cancer endorsed by Safe and Sound. It promises to be a fantastic day out for the whole family.